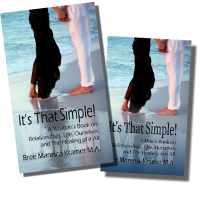 Relationship Books | Relationship help and Dating help Coaching by Expert Bree Maresca-Kramer M.A. It’s That Simple! Relationship Books Really Help! As a Relationship Expert, I am often interviewed on many different aspects of relationships including my relationship books for men and women. “How do these books help a relationship?” they will ask. The answer is simple…I took the healing process that I use with my clients and condensed it down into a simple to understand and follow book. I did this so those, who are unable to afford professional help or who are not ready for that step, would have the help they need for their relationship. “Why is there a book for men and a separate book for women?” is another question I am often asked. The reason I did this was because men and women are dissimilar creatures. We think, feel, and process information very differently, which is why so many couples have difficulties in their relationship. Because of this fact, I wanted to provide a book that spoke to each in a way they could easily understand and apply. Absolutely! Being aware this would be a good possibility, each book is written to stand alone as well as being a companion book with their partner’s. How to effectively communicate with their partner! How to identify the core issues causing problems in their relationship! How to heal those issues and learn new ways of relating to one another! How to change thinking and behavioral patterns that are not working! How to find the joy, gratitude, and love for their partner and relationship! Learn more about the It’s That Simple! relationship books here!